January 1, 2011 Angela G.
For as long as I’ve known, my family has been whipping up several varieties of comforting rice dishes – I can recall many a time coming into the kitchen to a pan of Arroz con Pollo finishing up in the oven, or a pot of Jambalaya simmering away on the stove. This version of the simple dish, a combination of rice, chicken, sausage, seafood and veggies, reminds me of home each and every time I whip up a batch. This version is far from super traditional, but I love it because it is way easy to prepare and incredibly piquant and flavorful. Some of the harder ingredients to find are substituted with pantry and supermarket staples. Though cajun purists would call this Creole Rice for its inclusion of tomatoes, culinary great Paul Prudhomme puts tomatoes in his, so I feel that I’m not in the wrong. Plus, this dish’s roots are born of the freshness and availability of ingredients, so use whatever suits your fancy – tasso ham (or smoked ham), seafood of any kind, smoked andouille sausage, duck, and homemade stock all have a place in this dish. Case in point, this recipe originates from the Spanish classic, paella, and if it weren’t for a few noble chefs swapping out a few ingredients, we wouldn’t have the jambalaya that we know today. Season chicken lightly with salt and pepper. Heat the olive oil in a dutch oven and add the chicken. Brown very well on both sides and then add the onion, scallions, celery, bell pepper and garlic. Once vegetables begin to soften, add the kielbasa, thyme and bay leaves. Allow to cook for a minute and then add the chopped tomatoes, white pepper, black pepper, garlic powder, cayenne and oregano. Stir in the rice. In a 4 cup pyrex or a measuring cup, drain the juices of the can of tomatoes into the cup. Dump the tomatoes into the dutch oven. Add the tablespoon of Worcestershire sauce into the measuring cup, and then add enough stock to make 3 3/4 cups of liquid. Add the mixture to the pot and stir. Bring the pot to a boil, cover and turn it down to a simmer. A trick, if you are careful, is to stick your ear to the bottom of the pot – you should hear a gentle bubbling. If it sounds like hell boiling over, turn the heat down. If you hear nothing, turn the heat up. Cook for 20 minutes, undisturbed. After 20 minutes, take the top off and add the shrimp. Recover and cook for an additional 5 minutes. Turn off the heat and remove lid. 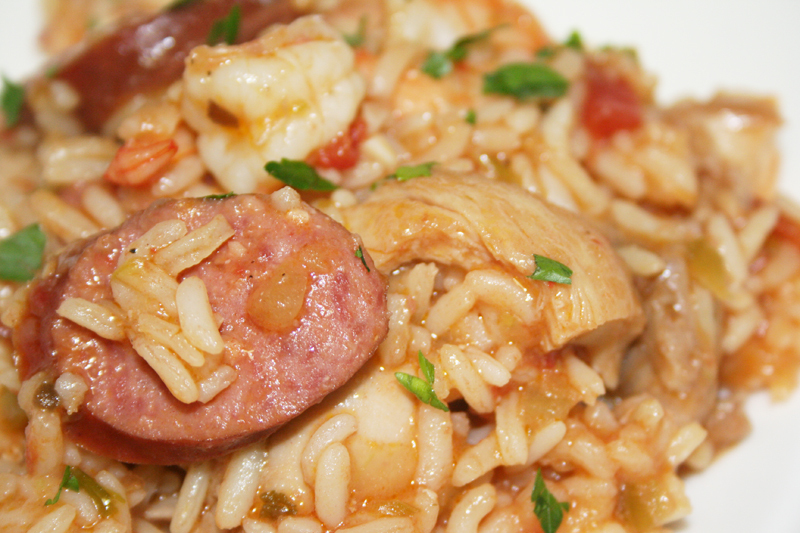 Stir a splash of white wine vinegar into the jambalaya and taste rice for doneness – it should be tender at this point. If not, turn heat back to low and cook another few minutes. If the rice is done but there is too much liquid, let rice sit, covered, for 5-10 minutes so that the liquid will be absorbed into the rice. Serve with scallions or parsley and tabasco sauce.